Disque vinyle de 180 grammes, Speakers Corner Records, fabriqué en Allemagne. Pure analogue, pressage et mastering audiophile à partir de bandes originales analogiques de l'époque. Maison d'édition d'origine : Decca. Conditionnement : 1 disque vinyle 33T, pochette cartonnée simple (poids 350gr/m2) et sous-pochette doublée. Disques vinyles fournis par Planète Disque sont emballés dans un carton robuste avec intercalaires de calage et une pochette plastique luxueuse en PVC. Sonically, this record – made in 1956/57 – is one of the best ever produced by DECCA. The listener is literally swept off his or her feet. To better enjoy this tremendous experience, we would advise listeners to put their feet up, relax, and listen with rapt attention. A “Do-not-disturb” sign on the door is to be recommended. The tremendous sound emanating from the loudspeakers immediately conveys the rousing nature of the music. Conducted by Ataúlfo Argenta, the London Symphony Orchestra plays with a rare vitality, pure enjoyment, precision and lucidity. 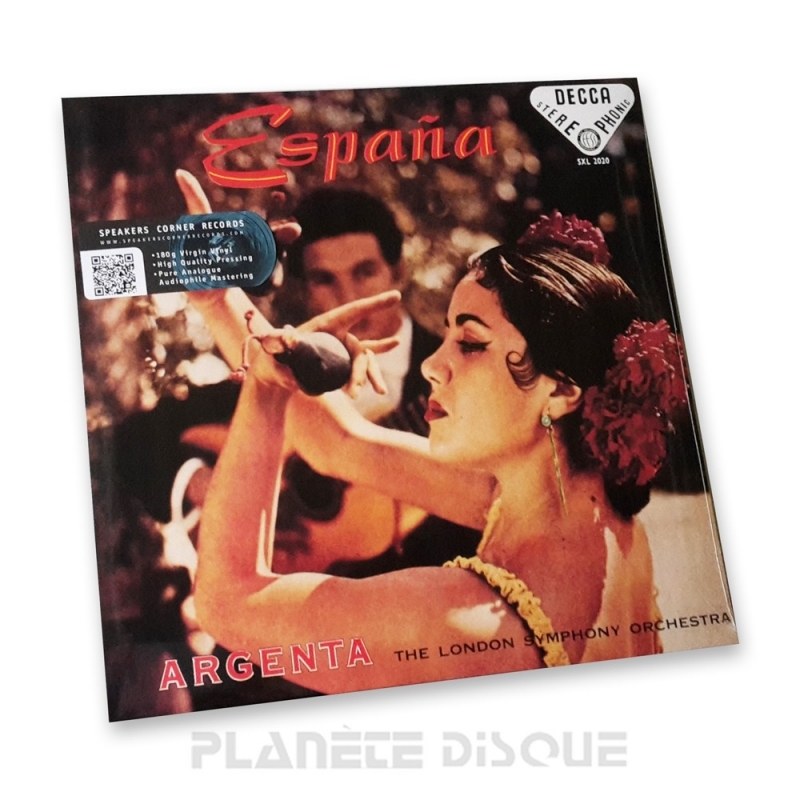 This is a carefully chosen medley of Spanish music which, interestingly enough, was mostly written by non-Spanish composers. All in all, this has become a legendary recording, which caused quite a stir even in its mono version. The FFSS version ranks among the very best recordings ever issued.